Guidelines provides concise clinical guideline summaries of major primary and shared care guidelines in the UK. Additionally, European guidelines from some of the major independent professional bodies are also summarised and included. All Guidelines summaries are reviewed and signed-off as current by the original guideline development group at least once each year. Registration is free UK-based doctors, nurses and pharmacists. Other healthcare professionals can access a low-cost subscription. Once you have registered with Guidelines you will you will be able to update your areas of interest and responsibilities, and email communication preferences, which will ensure we bring you the most relevant content. 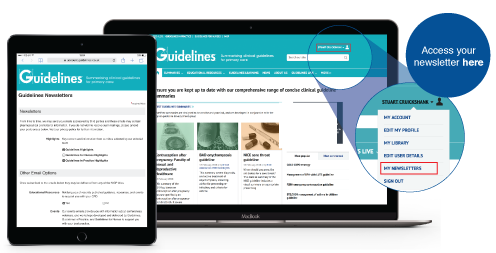 The Guidelines app is free to download and all of the content is easily accessible using your Guidelines.co.uk account details. The app contains all the content from the Guidelines handbook plus additional summaries from Guidelines.co.uk. To gain access to all of the content, simply enter your email address and Guidelines password within the login section. notes feature to annotate relevant summaries. Guidelines contains summaries of national and European guidelines. Guidelines published by NICE and SIGN are included, as are guidelines produced by independent professional bodies. a guideline should represent a clinical area rather than a drug or class of drugs. If you have produced, or are aware of, any guidelines not currently published by Guidelines, please contact the editorial team. Advertising with Guidelines will ensure your brand message reaches an engaged audience of GPs and healthcare professionals. Independent research through the National Medical Readership Survey of GPs (NMRS November 2017–August 2018) indicated that Guidelines is referred to over 719,000 times per print edition. By advertising in print and online, Guidelines delivers a total GP audience reach of 64%. If you would like to interact with our audience, we also offer a range of commissioned educational services, including events, webinars, and eLearning modules. If you believe we have not met the highest editorial standards, please read our complaints policy and fill out the form on the page. We take all complaints seriously. All complaints will be dealt with confidentially.